This floriferous summer-growing plant produces delicate, bright pink flowers which bring a magnificent colourful display to your garden towards the end of the warm summer when not much else is flowering. Nerine filifolia is a semi-deciduous, perennial bulbous herb. Bulb up to about 30 mm in diameter. Leaves filiform (slender, thread-like), semi-succulent, green, up to 300 mm long, glabrous. There are up to 9 flowers arranged in an umbellate inflorescence, up to 150 mm in diameter, at the end of a single scape (flowering stalk) scape up to 300 mm long, green, finely/minutely white-hairy, with 2 recurved, membranous bracts (spathes) at point where pedicels (individual flower stalks) arise; inflorescence buds narrowly ovate, acuminate. Pedicels green, minutely white-hairy, up to 40 mm long. Flower buds dark pink. Tepals ('petals') 6, glabrous, recurved, up to 40 x 3 mm, margins undulate, bright pink, fading to lighter pink with age. Stamens 6; filaments ± erect, slightly longer than 'petals', ± unequal in length, pink; anthers initially black, cream when mature because of released pollen. Style shorter than stamens, ± two thirds of the length of the filaments, pink; stigma dark pink. Ovary inferior, 3-locular, sub-globose, green. Capsule reddish at maturity, thin-walled. 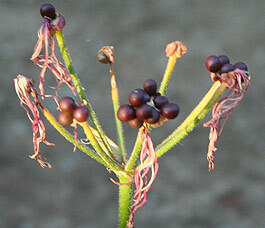 Seeds fleshy, initially green, turning dark reddish brown. Flowering time: (January) February to April, but in the wild, plants in flower have been collected as late as July. According to Raimondo et al. (2009) the conservation status of this species is LC (Least Concern). 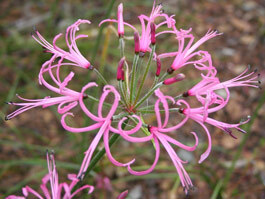 Nerine filifolia is an Eastern Cape endemic. It grows in large colonies in shallow depressions in heavy clay soils on exposed rock slabs, frequently inundated during the summer rainfall season (Duncan 2002). The specific name filifolia refers to the thin, thread-like leaves: filum = thread, folia = leaves. For the derivation of the genus name, see descriptions of other Nerine species in this series e.g. Nerine humilis. The flowers are regularly visited by flying insects like bees and butterflies which are obviously responsible for its pollination. Nerine filifolia can be cultivated for cut-flowers, as the flowers have a long-lasting vase life and are well worth using in flower arrangements. No other uses for this species could be traced. 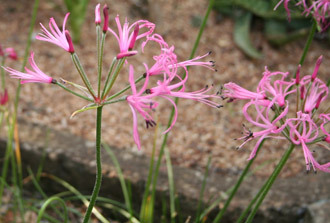 Nerine filifolia is fast-growing, and bulbs multiply rapidly. It grows well in a wide variety of soils. Plant bulbs during spring in summer rainfall areas. Plant them where they will be exposed to full sun for most of the day. This will encourage the production of strong, straight, upright flowering stalks. They can be planted en masse, as a border to a mixed flower bed or along a garden path. They are also suitable for growing in containers in a sunny position, but ensure good drainage. They will survive with little water, but for a brilliant pink colour display in the middle of summer, it is better to water them regularly. If watered during the winter months, they will keep their leaves, otherwise the leaves will die off but will resprout the following spring. They can be cultivated by planting mature bulbs directly where you want them in your garden. Plants can also be propagated from fresh seed, but they will take much longer to flower. Plant the seeds in a suitable potting mixture and water regularly. The bulbs can be transferred to the garden after a year or two. Unfortunately Nerine species, like many other amaryllids, are prone to attack by the amaryllis caterpillars. The plants should be regularly examined and action taken as soon as infestations are spotted, or else your plants can be totally defoliated and the flowers ruined. As a precaution, treat your plants regularly during the growing season to prevent them from being attacked. Duncan, G.D. 2002. Growing nerines. Kirstenbosch Gardening Series. National Botanical Institute, Cape Town. Raimondo, D., Von Staden, L., Foden, W., Victor, J.E., Helme, N.A., Turner, R.C., Kamundi, D.A. & Manyama, P.A. (eds) 2009. Red List of South African plants 2009. Strelitzia 25. South African National Biodiversity Institute, Pretoria. Snijman, D.A. 2000. Amaryllidaceae. In O.A. Leistner (ed. ), Seed plants of southern Africa: families and genera. Strelitzia 10: 570-576. National Botanical Institute, Pretoria. Snijman, D.A. & Archer, R.H. 2006. Amaryllidaceae. In G. Germishuizen, N.L. Meyer, Y. Steenkamp & M. Keith (eds), A checklist of South African plants. Southern African Botanical Diversity Network Report No. 41: 858-869. SABONET, Pretoria.